ArtRage has grown up, but it has lost a little of its charm. Still almost a fifth of Painter's price, though! To create the illusion of paints, pens, chalks and more on your Mac, you used to have to sink hundreds of pounds into a copy of Corel Painter. No more, thanks to Ambient Design. We've long been fans of ArtRage. Version 2.5 of the 'standard' edition is still available, still awesome, and still only costs 20 bucks. Now, though, Ambient Design has created two new sister products, called Studio ($40) and Studio Pro, the version we're reviewing here. Both products on the Studio line add a slew of new media types, some serious, some not so much. It's great to see a new watercolour engine and a basic, flat inking pen; the new Sticker Spray tool will doubtless be great for kids and hobbyists, though it's easy to see how it could be used to create garish works. There are lots of zany clip-arty presets in the Sticker Spray tool that are worth exploring, even for serious artists; the hair and fur presets, for example, can be a quick way to block in some detail. The Pro edition can even create Sticker Sheets. While ArtRage 2.5 is a fairly simple, painting-focused app – albeit one with pro-sounding features such as layers – the Studio range does try to be a bit more grown-up and capable. Both Studio and Studio Pro have a selection tool to let you grab and manipulate bits of your canvas, though Pro's tools are more capable; where Studio can select only rectangular and elliptical areas, Pro gets polygon, freehand, and Photoshop-like magic wand and Quick Mask-style paint-on selections. Both also have a text engine, though it's basic. Both also import Photoshop files with editable text, something ArtRage 2.5 can't do. Indeed, the Pro version not only has a blur and colour adjust filter built in, but it can also use Photoshop compatible filters – or at least it promises to; sadly, none of the components of onOne Software's Plug-In Suite 5 is compatible, which is a shame as it would have been nice to use PhotoFrame – and there's no definitive list of supported plugins. 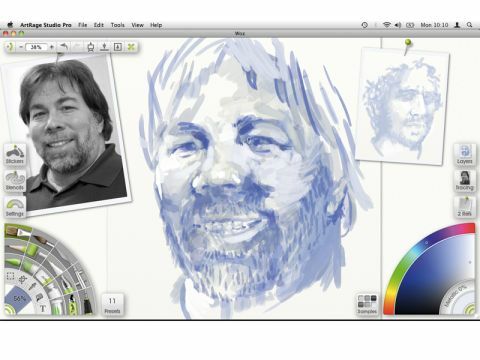 While ArtRage 3 Studio Pro only adds to what ArtRage 2.5 does, we're less fond of it. It's partly the price, and partly that the brace of Studio apps don't seem to have decided what they are. They're pitching at a more professional audience, but they add a lot of unapologetically fun features that pros wouldn't touch with a bargepole. They're not especially stable, either, particularly when working with large, print-res files. Our recommendation: unless you want the no-more-than-competent watercolour engine, buy ArtRage 2.5; it gets you a $15 discount against one of the Studio products anyway, so you can upgrade later.